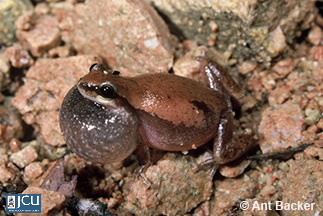 This frog has a blunt snout and short legs, colour on the back varies from grey through to brown or reddish-brown with darker patches present on the back. Belly is white, groin lemon-yellow. Fingers have a little webbing and the toes are partially webbed.